The jingle bells are ringing and the carolers are singing. The holiday season is upon us. Just like every holiday season, we are constantly reminded of how this is the time of giving and receiving. I was going to kick off the season with a wish-list gear guide, but instead I thought it better to save that for later and focus on the giving side first. When it comes to life in and out of my running kicks, I have plenty to be thankful for. Family and friends, faster race times and new distances, a great DC running community, and the beautiful future Mrs. RCR. But when it comes to running, my running life has remained a pretty selfish and self-centered. I work hard to improve my times, push myself to new distances, and absorb whatever mental and physical peace the run gives me. Rarely do I run for others or use the hours spent training for anything other than personal gain. So here we are, wrapped in this time of over indulgence and consumerism, and I’m thinking I should use my most selfish daily act to help someone else. You should too. About two months ago I decided it was time to look back into the program and see how I could get involved. After a short orientation, I signed up to join a team and started running with the group a few days later. The experience has been incredible thus far, and it is very clear how this community of runners is helping and encouraging each other. We all need a lift sometimes, and BoMF provides that lift to a lot of people who may have never considered themselves runners before joining the group. The group trains together, races together, and 3-4 days a week meets at 5:45am to start their workout. It is incredibly encouraging to be a part of this very diverse group coming together to share, help, and encourage each other. Back on My Feet has programs in several cities, including: Washington, DC, Baltimore, Philadelphia, Indianapolis, Boston, Atlanta, Chicago, Dallas, and New York. On each of those websites you will find further information on what the program is doing in that community and how you can be involved. 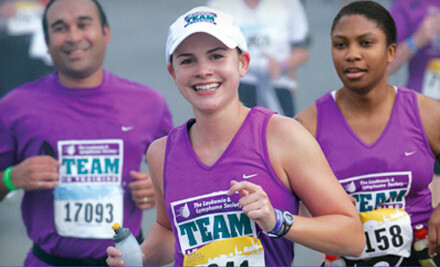 We’ve all see groups like Team in Training, Girls on the Run, and Run to Remember. Sometimes their presence can be so large at a race that you feel like you are a part of the group too! If you aren’t all that familiar with the groups, they usually offer training plans, running groups, support and community for participants who sign up to raise money for their cause and train with the program. For many people, it is a great way to get a little motivation and encouragement during the difficult training period, as well as raise funds for a group that needs it. If you are looking for a way to give a greater meaning to your upcoming race, consider joining one of these groups or raising money for a charity involved in the race. Check the group’s website or the race organizer’s website for a list of participating charities and how you can join. As the sport grows, charity races are also becoming more and more popular. A great DC area example is the SOME Turkey Trot held every Thanksgiving. This year had more than 10,000 runners taking on the 5k course. Check out the race calendars for your area and find a race hosted by a charity or non-profit using the event as a fundraiser. Didn’t register for a race in time? Often times with larger races you can gain a late entry if you commit to fundraising for one of their selected charities. Check out the race’s official website to see if that option is available. Working hard to improve your times and distances doesn’t mean that you are only running for yourself. By running for a charity, working with a non-profit, or even just talking your running partner through a tough time, you can add some real pleasure to your training. It helps me get out of bed for that incredibly early morning run if I know others are counting on me too. Call for Comments: Have you ever participated in a charity training group or worked with a running non-profit? How was the experience?